Recently a reader tried (and loved) the 100% rye recipe on the website and sent me a few questions. They are great questions, so I thought I would answer them here. Checkerboard rye. Why not bake multiple loaves - you can decorate them individually!! Hot out of the oven and VERY sticky if you don't let it cool and set a bit. 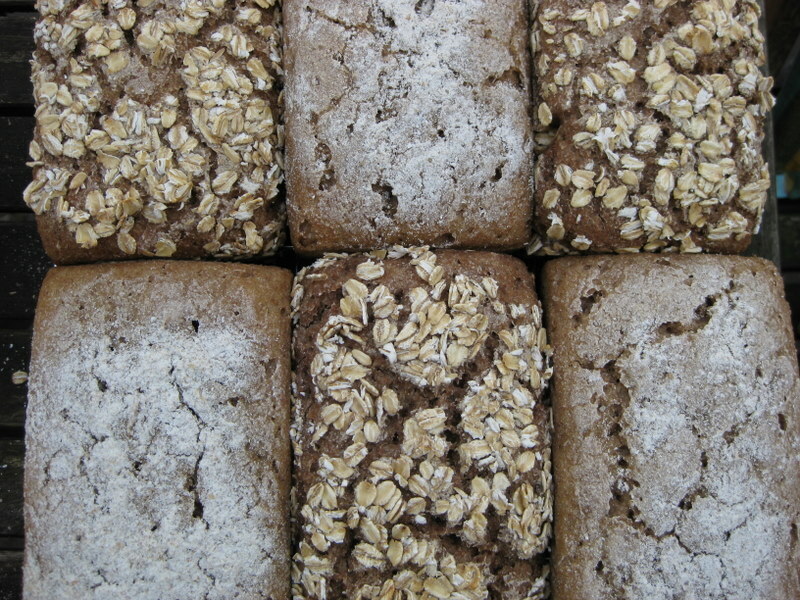 Click here to read a bit more about rye bread recipes. Click here to take a bread class with us. Love your rye? Click here to take the All About Rye class with us! I'm wondering about the instructions for replenishing the rye starter on page 41 of your book "Homemade Sourdough"
I am afraid, I did not write the recipes (I wrote the science) for Homemade Sourdough. The publisher had so many complaints about the recipes that they asked me to rewrite the book completely which I did. The new book is called Perfecting Sourdough. Having said that, the rye starter I use is a very liquid starter. To make the starter, I use twice as much water (by weight) as rye flour over four days. To refresh the starter I use a 1:3:6 ratio. So, I will take (for example) 20 grams of starter (I store mine in the fridge) and I add 60 g flour and 120 g water. Stir, cover and leave for 8-12 hours depending on how warm it is. If it has over proofed at that stage (because I leave it too long) it will have separated but as long as it has bubbled up (you will see the "tide marks" on the side of the bowl) and is within 18 hours of having been started it will still work just fine. I hope this helps. Please come back to me with any further questions. Is it possible to make 100% dark rye bread using the no-knead dutch oven 12 hour rising method? Hello, well, you never knead 100% rye. You just stir it together and then pop it straight in the tin. If you put it in the fridge you could leave it for 12 hours if you wanted it but that's a long time (even for rye). You may find 8 hours is enough. If you would like to pop the tin into a cast iron dish, you can do it. WYou could also proofe in a basket and then turn it out onto paper and put this in the cast iron dish to bake. Prepare for it to collapse somewhat. Rye does not keep it's shape through the baking process. It flattens a bit. 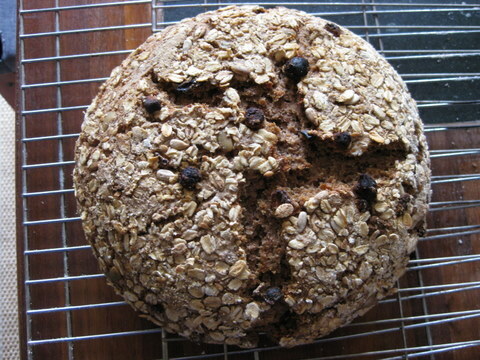 love your website, and have just started baking 100% rye flour bread! I have two questions. 1. My flour seems very dry and I think needs an incredible amount of water to "be very soft". Is it possible to use too much water? Or perhaps my definition of "very soft" is askew? If it's like dough for North American muffins - is that too soft? 2. 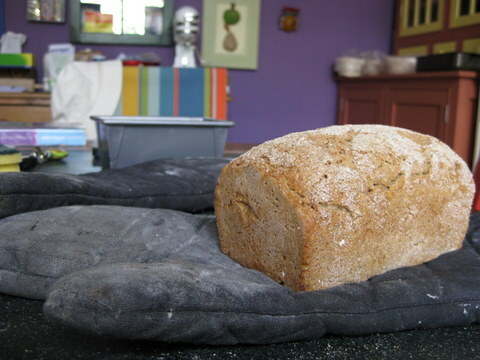 How can you tell when your rye dough is proofed vs. over proofed and ready to go in the oven? I think I've been waiting too long and I get a collapsed top with a separated crust. I wish there was a way to post a photo here! My second go round with the 100% rye was more successful, but there were still some issues. I'm sure it wasn't over proofed, but the bread had a crack in it about 1/5th of the way down, roughly parallel to the upper crust. I used half kefir and half water, and the liquid proportion still seemed enormous to the proportion of flour. I started the oven at 230 celsius, and lowered it to 200 after 10 minutes. It was still delish, though! Any suggestions? thanks so much!! Dear Lexie, it is possible to use too much water - you would get a batter and not a dough but you really need quite a bit so that when you gather it into a ball in the bowl and push it with your finger it is soft and not gritty. 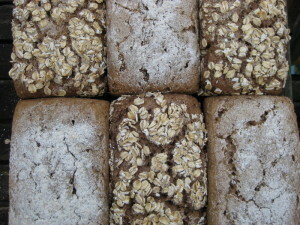 Rye absorbs more water and some rye more than others (grains are all different and it also depends how dry the flour is). when it is ready, there are holes in the top. overproofed the dough will have collapsed into itself and possibly even gone down in the tin. Separated crust is a clear sign of overproofing! OK that means it's UNDER proofed! Try again and you will get the perfect loaf! The proportion of water to rye can be 1 to 1. I would not worry about it. If it's working out, you are getting it right.